Series consists of materials reflective of the education and outreach activities of the Bastion Theatre Company of British Columbia, arranged into five sub-series: Theatre school, 1965-1988; Theatre-in-education, 1980-1988; Outreach, 1977-1987; Youth tours, 1974-1985; and Photographs, 1968-1987. 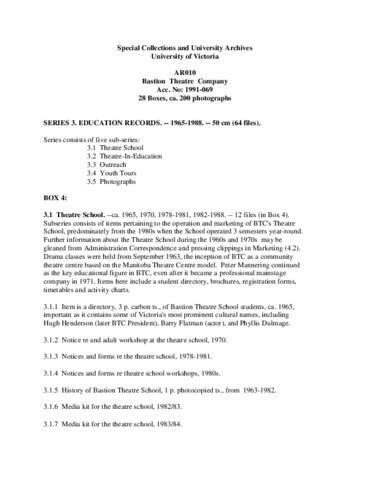 Included in this series are materials pertaining to the operation and marketing of the Theatre School; teaching manuals and correspondence pertaining to the Craigflower Schoolhouse Project, 1986-1987; outreach program materials; and photographs of youth productions. The Youth tours sub-series contains materials generated through the Theatre's youth tour program, the largest in Canada at the time, including itineraries, correspondence, teacher kits, contracts, show programs, feedback questionnaires, and scripts.